Free Trees for Oncor Customers! Get them while they last! All Oncor customers (that means you) can claim two FREE TREES from Oncor and Arbor Day Foundation. Planting in the right place could save you up to 30% on summer cooling and winter heating costs! Read more at www.arborday.org/oncor, and then visit this link to reserve your trees. And remember, once they're gone - they're gone! Check out this month's issue of The Oak Leaflet online! 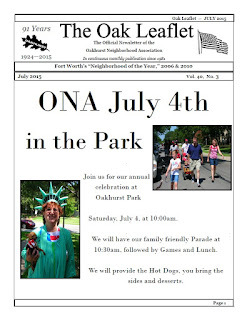 This edition advertises our July 4th activities, remembers Frances Gourley Turrella, showcases July's Yard of the Month, shares information on handling mosquitos, and notes some erosion control issues observed at the recently-cleared Oncor tower sites. Visit our Newsletter Archive to view* or download your copy. *Please note: Depending on formatting, certain images may not preview correctly online. Please download the PDF to your computer or mobile device for the optimal viewing experience.